Attack 1 : BARNEY RAGE!!!!!!!!!!!!!!!!!!!!!!!!!!!! 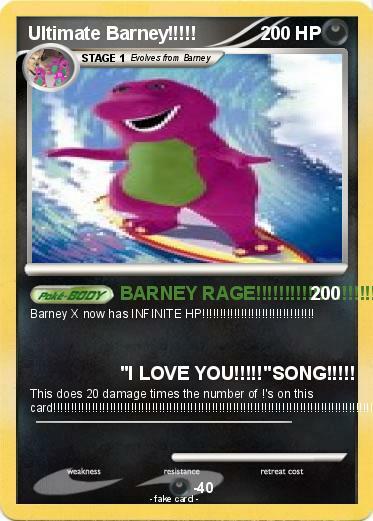 Barney X now has INFINITE HP!!!!!!!!!!!!!!!!!!!!!!!!!!!!!!!! Attack 2 : "I LOVE YOU!!!!!"SONG!!!!! This does 20 damage times the number of ! 's on this card!!!!!!!!!!!!!!!!!!!!!!!!!!!!!!!!!!!!!!!!!!!!!!!!!!!!!!!!!!!!!!!!!!!!!!!!!!!!!!!!!!!!!!!!!! !